Today is the Festa della Liberazione, a national holiday in Italy commemorating the liberation from fascism at the end of World War II. Quite an important historical event to celebrate and an even more important one to never forget. 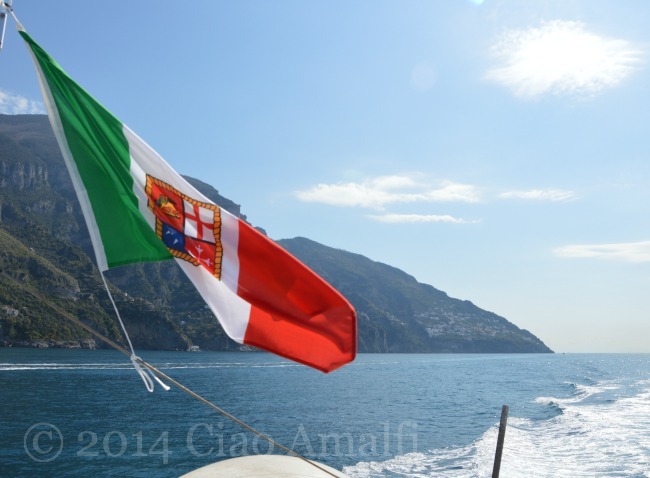 I caught this photo of the Italian flag (with the symbols of the four maritime republics from the Middle Ages – Amalfi, Genoa, Pisa and Venice) off the back of the ferry from Amalfi to Positano. There couldn’t be a more perfect day to share than today! This morning we set out early to do some shopping for Easter lunch before the shops got too crowded. 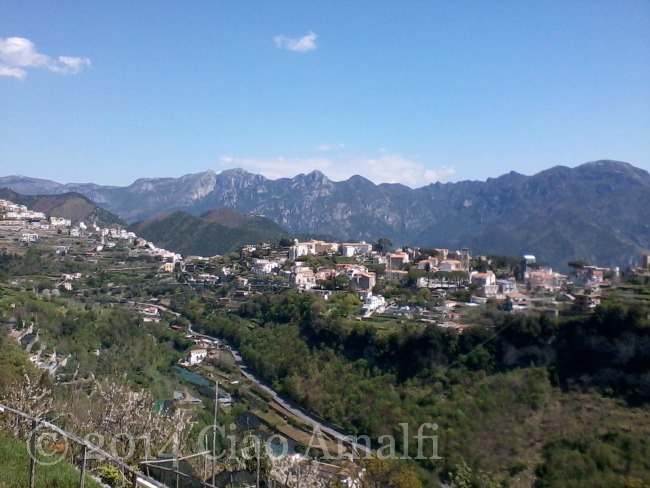 As Easter is really the kick off to the tourist season on the Amalfi Coast, we also hopped to beat some of the traffic. We got through the shopping at the fruit and vegetable shop (line not too bad), the butcher (line much longer) and even scored a small pastiera without too much of a wait at all. 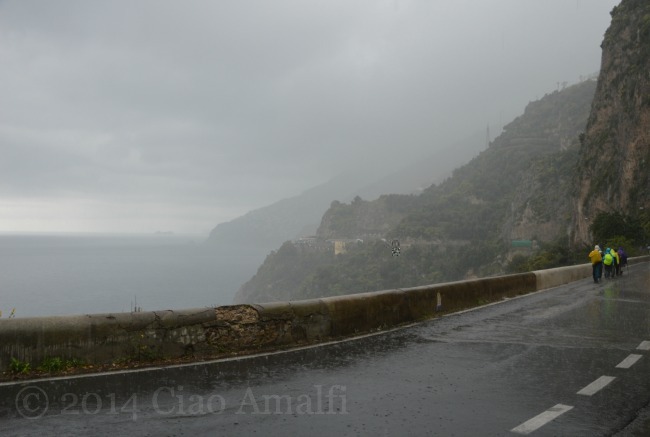 We whizzed past the traffic that was totally blocked coming into Amalfi (cringing because we knew we’d have to come back that way since there is only one road …) and decided to stop by the mechanic in Conca dei Marini to have him look at the tires on the car. 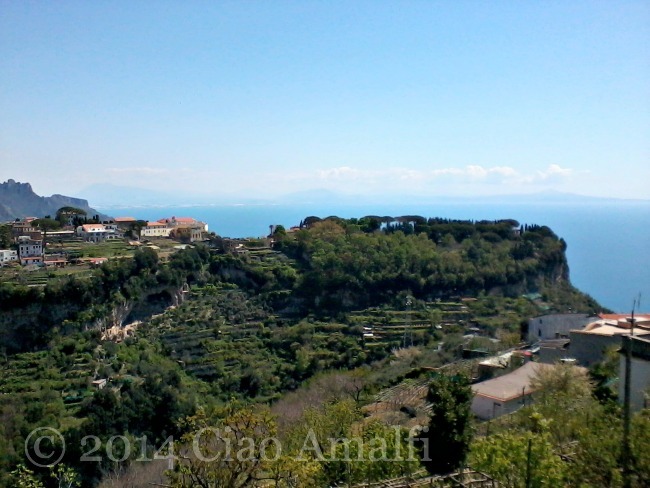 Big heavy clouds loomed over the mountain, but the view toward Praiano with the Li Galli islands off the coast was still a lovely sight while we waited. 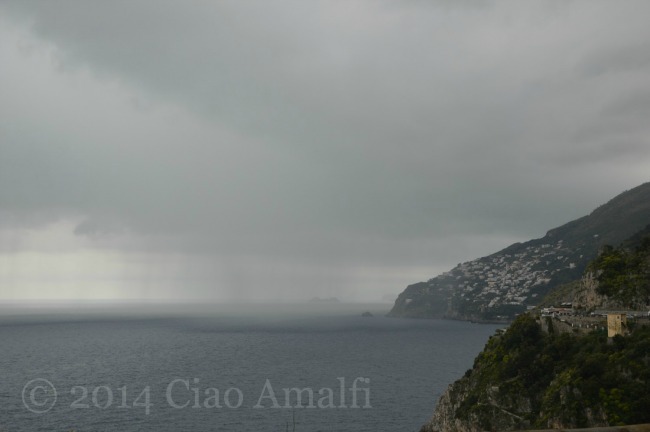 After awhile the sky darkened and I watched as a rainstorm swept quickly across the sea toward the coastline. Just before the rain arrived there were several young tourists that passed by with a map looking rather confused and in search of a hiking path in the mountains high above. I poked my husband outside to help them, but there was really no convincing them otherwise, so he eventually just pointed them in the right direction. One wouldn’t really call this a good day for hiking, yet there were a lot of people out doing just that. At least the hiking group below were mostly fitted out for the rain, although their boots were sounding a bit squishy as they trudged past. They looked happy though! 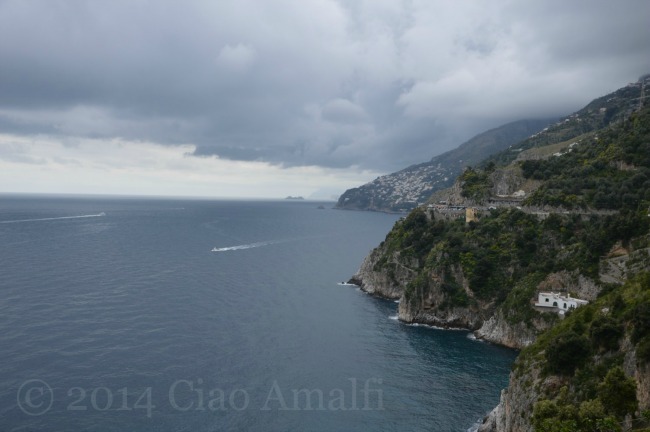 It’s a long way to Tipperary, er, Positano in the rain! On the way back to Amalfi we did get stuck in that traffic, and it was getting later and later by the moment and our stomachs were rumbling. 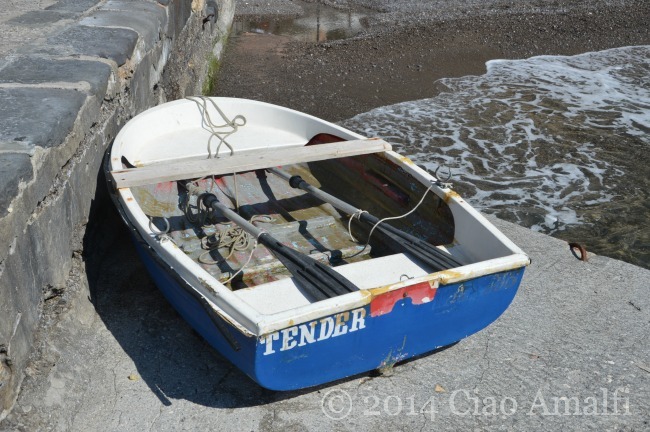 I rustled through the shopping in the back seat of the car and pulled out the small casatiello, a rich bread made for Easter in the Naples area, and tore off a chunk for each of us while we waited. I suggested some sopressata and my husband dug out a knife he keeps in the car for emergencies. 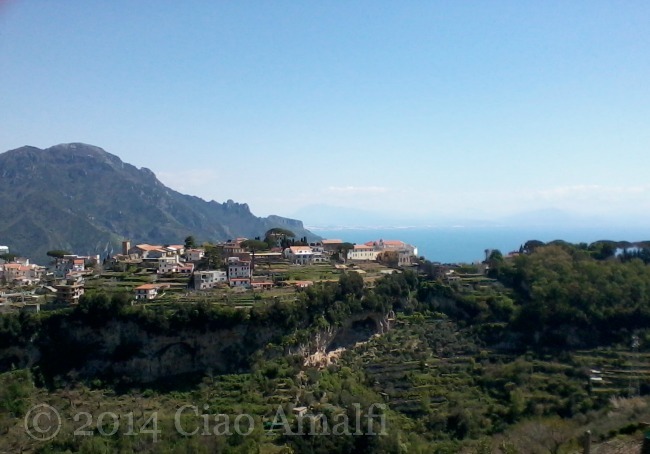 You know, emergencies like pre-Easter picnics in the car while stuck in traffic in Amalfi. One must always be prepared. It was hilarious and delicious at the same time. So, the shopping for Easter is done and there’s still a little sopressata left for tomorrow. Buona Pasqua a tutti! 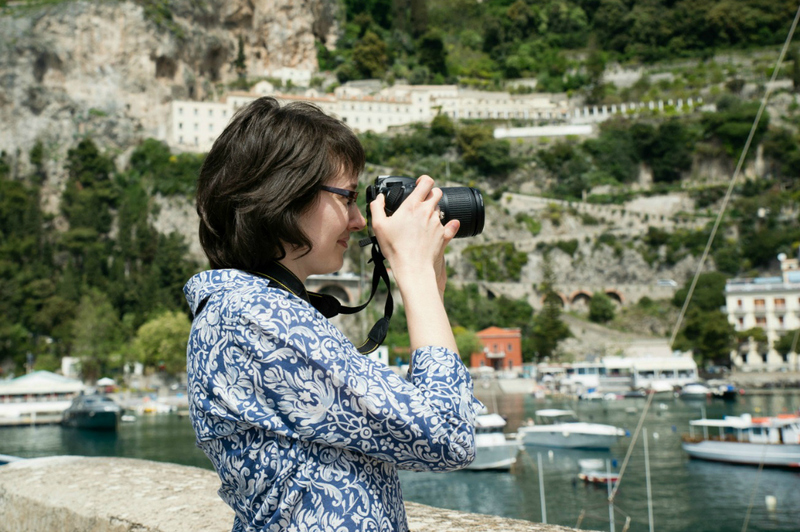 When I’m in Positano there’s always one person I miss – my mom. I’ll never forget that February day back in 2007 when we first walked on the beach together, picking up sea glass and pebbles and alternating between smiling and crying from happiness. This photo is dedicated to my mom, Sandra Thayer, who taught me to love so many beautiful things in life. For, my darling, I love you and I always will! Leave me alone with a view like that and some sort of photographic device and you can bet that I’ll try to capture it in some way. That’s what I did with my several year old simple Samsung phone this morning when looking out at the blue sky and sea. What a glorious spring day! It’s just so beautiful today that I had to try to take a few photos to share! In the sunshine it looked like they hadn’t come out at all, so imagine my surprise when I downloaded them and found these. And they don’t even begin to show what a beautiful day it really is! That being said, it’s supposed to rain tomorrow. Welcome, spring! I woke up this morning just after sunrise but before the alarm beeped the beginning of a new day. I’m a morning person, even on the mornings when my body feels like starting a little bit slower. Even before I had moved, my brain was fighting its way through the fog of sleep and when I woke up it was full of words. 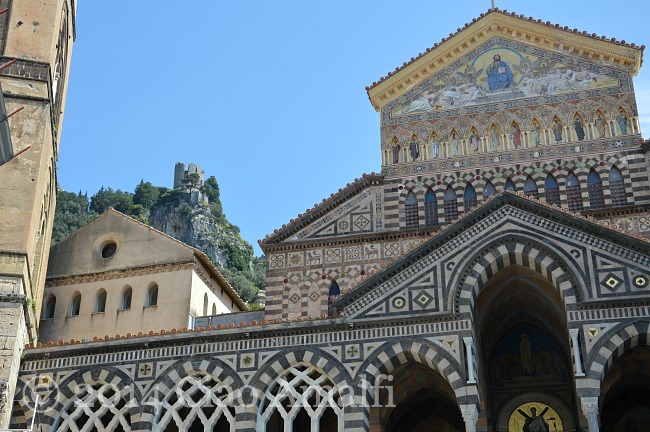 It was crafting a piece on the Duomo of Amalfi that I hope to share soon on Ciao Amalfi. I jumped out of bed, hurried to my desk and began scribbling on all the little scraps of paper I could find to get it all down. When I finished the 7am church bells rang. I wonder just what had I been dreaming about?